For avid lovers of all things good food like me, who spend a great deal of time thinking about food, Thanksgiving is the holiday that crowns them all~food glorious food is center stage. Oh yes, Thanksgiving is a BIG celebration at my house. So, it is probably not surprising that some time in September or October, I started thinking about my Thanksgiving menu. My November food magazines are certainly the most worn out issues of the year. My Thanksgiving starts with traditional stand by favorites, but I am always adding new side dishes, desserts or updated twists on traditional favorites. I am a food lover highly influenced by my environment and visual triggers. (fresh and artisan foods- major triggers) The other day I was shopping at Trader Joe’s and was pleasantly surprised to see fresh beautiful stalks of Brussels sprouts piled on the shelf. (Images of Thanksgiving flashed through my head) I must admit, Brussels sprouts have never been high on my list for Thanksgiving sides, however, the joy of seeing these Brussels sprouts still on their stalk pulled at my gardening, farmer’s market urge of fresh pure homegrown simplicity. I was smiling. Seeing these Brussels sprouts made me wish I had grown them, maybe next year. Once at home with my prize Brussels sprouts stalk, I remembered seeing Brussels sprouts recipes while flipping through this or that magazine, cookbook, blog or Internet site. I did not have a Brussels sprouts recipe as a stand by favorite ready at hand. I searched and actually found a good number or recipes that tempted my taste buds. Half a Brussels sprouts stalk(just over a pound) went into making a simple saute of Brussels sprouts~it was rather boring. 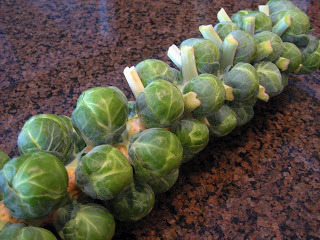 I started thinking, this is why I don’t crave Brussels sprouts, maybe nobody really likes Brussels sprouts. But I still had half a stalk of Brussels sprouts so, I tried another of my “selected” recipes from a reliable source, “Sunday Suppers at Lucques” by Suzanne Goin. These Brussels sprouts were amazing, blissful, I was smiling again! I am a new Brussels sprouts promoter, I am ready to run out and get more Brussels sprouts. These Brussels sprouts will definitely be on my Thanksgiving table! 1. Heat a large saute pan over high heat, add butter and olive oil. Heat and melt butter about 1-2 minutes. 2. Add Brussels sprouts, stirring to coat them with the butter and olive oil. Season with 1 teaspoon salt and some pepper. Continue to brown about 2 minutes. 3. Turn heat down to medium. Continue to cook for about 3 minutes. 4. 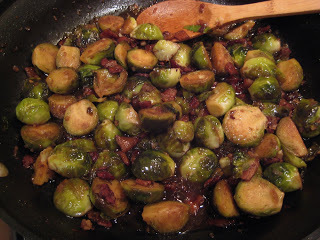 Add diced bacon to the Brussels sprouts and cook until bacon starts to crisp about 8 minutes. 5. Add shallots and garlic, cook for about 2 minutes. 6. Add balsamic vinegar, reduce by half. 7. Add chicken broth and turn heat to medium high. After 3 minutes, strain Brussels sprouts out of saute pan to a baking sheet. 8. Continue to reduce liquid to about 1/4 cup. 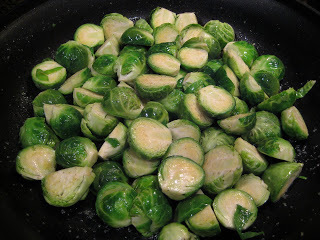 Return the Brussels sprouts to the pan and reduce heat to low and coat with balsamic/broth syrup. I LOVE Brussels sprouts. I think they are delicious. I love a simple roasting with salt and pepper. Even eating them cold the next day brings me joy. The recipe above looks delicious, but what can be expected when there is bacon involved?? Yes, bacon makes everything taste better, especially applewood smoked bacon. Enjoy the season of Brussels sprouts!